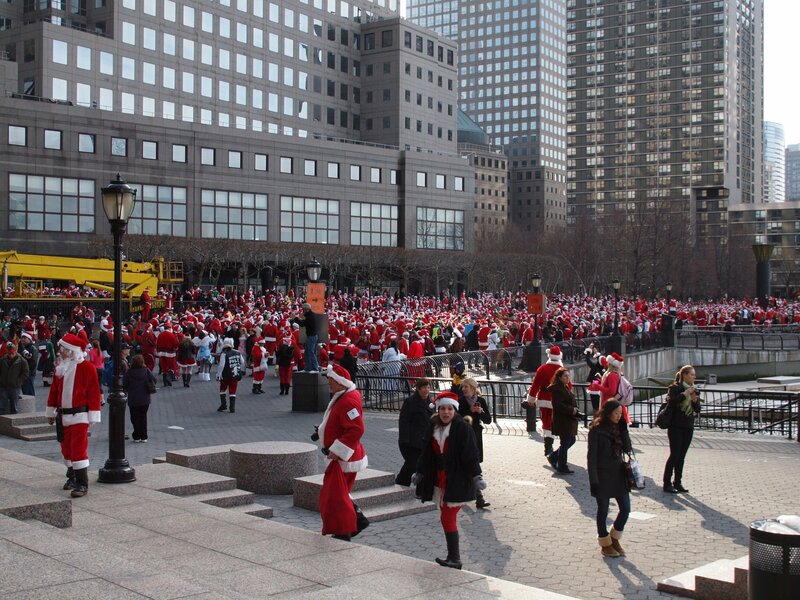 So 10,000 Santas walk into a bar . . . 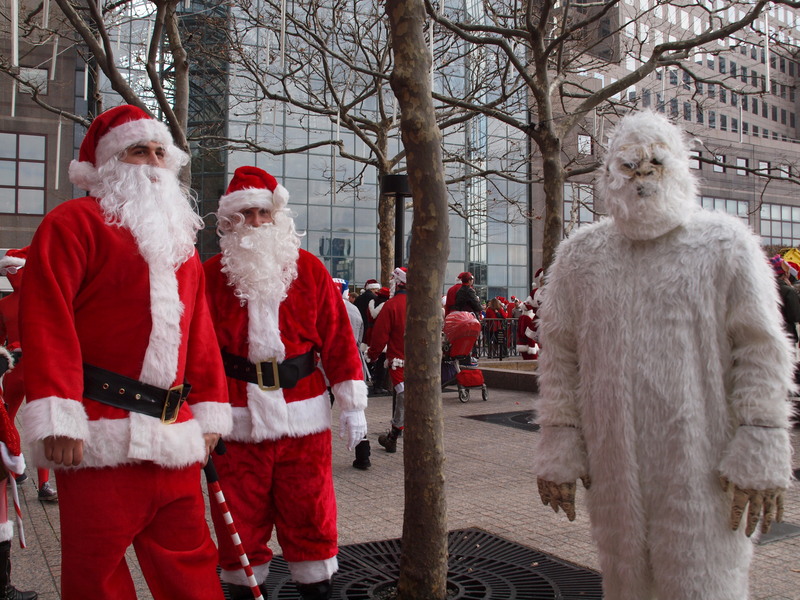 Yesterday was the annual event known as Santacon in New York City. Thousands and thousands of people clad in Santa suits, as well as other seasonally appropriate costumes (Buddy the Elf is a perennial favorite, and for those of the Jewish persuasion, some human dreidels can always be counted on to show up), cavort throughout the city. And sometimes the outfits bear no discernible relation to this time of year. For example, one of my favorite participants yesterday was the person dressed as a giant Chiquita banana. So the sea of red was interrupted by a giant yellow fruit. The movements of the thousands of Santas are not random. A mysterious behind-the-scenes leader periodically tweets instructions indicating where in the city the throng should next assemble (an example of an actual tweet from yesterday is “Santa’s on the move! Point your sleigh toward the red steps at Times Square.”). In between those official check-ins, the Santaconners file into bars that are near the previous meeting point. Sometimes the organizer tweets suggestions as to where the Santas should imbibe. Said imbibing begins as early as 10:00 a.m., and is, of course, a major part of the day’s activities. However, Santacon is so much more than a mere pub crawl. As with a more conventional pub crawl, the actual getting around involves a considerable amount of walking. Sometimes, however, the distance to be traversed is just too great, and the Santas must descend underground to ride the subway. Chants such as “Santa rides the 6!” (a reference to the number 6 subway line that serves the East side of Manhattan) are not uncommon in that situation. 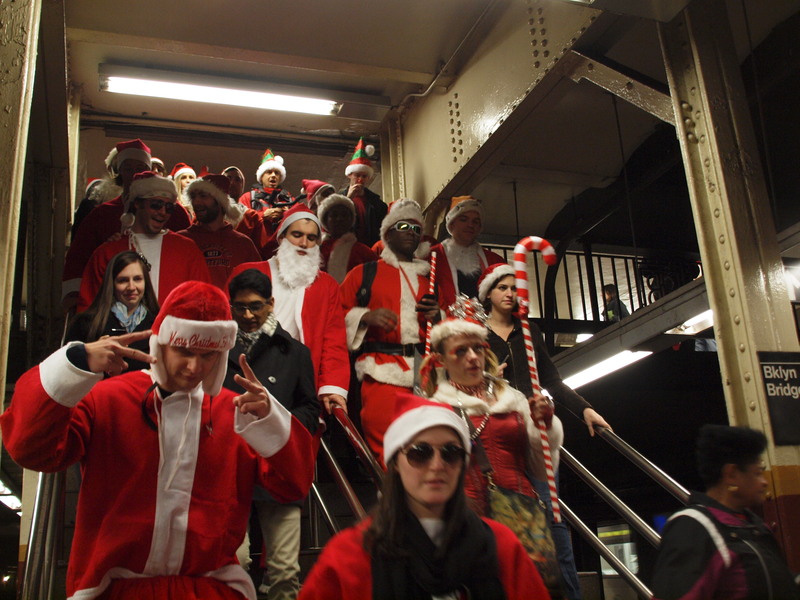 Hordes of Santas pour into the subway trains, much to the befuddlement of the non-Santacon-affiliated passengers on board; and the rides tend to be punctuated with (often dissonant) caroling. The greatness that is Santacon is not confined to the Big Apple, although New York City’s version of this festival of debauchery is by far the biggest (I have not yet seen any attendance figures for yesterday’s iteration of the New York City Santacon; but I’ve heard that in 2010 the turnout was estimated at 10,000). While other cities cannot match New York for sheer volume of participation, Santacons are now held in 32 countries around the world. 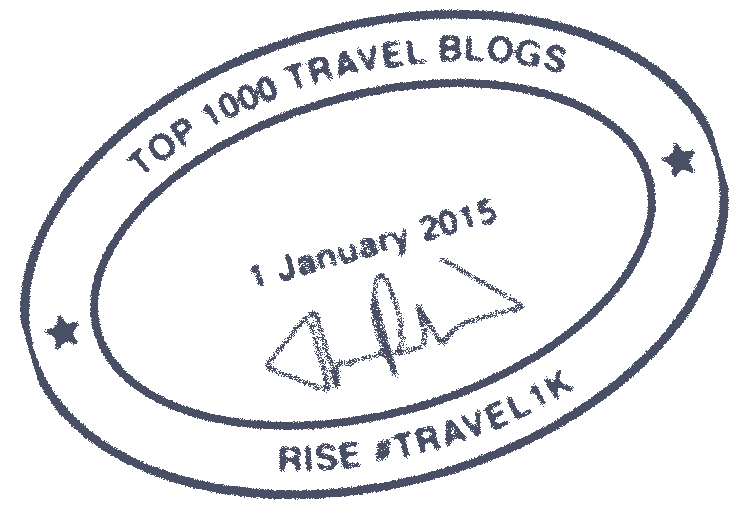 According to the offical website, even denizens of McMurdo Station in Antarctica participate in one (yes, McMurdo Station is the same place to which I aspire to travel to make Antarctica the seventh continent on my World Karoke Tour. And yes, the good people down there are really on the wrong pole to be hosting a Kris Kringle-oriented event). 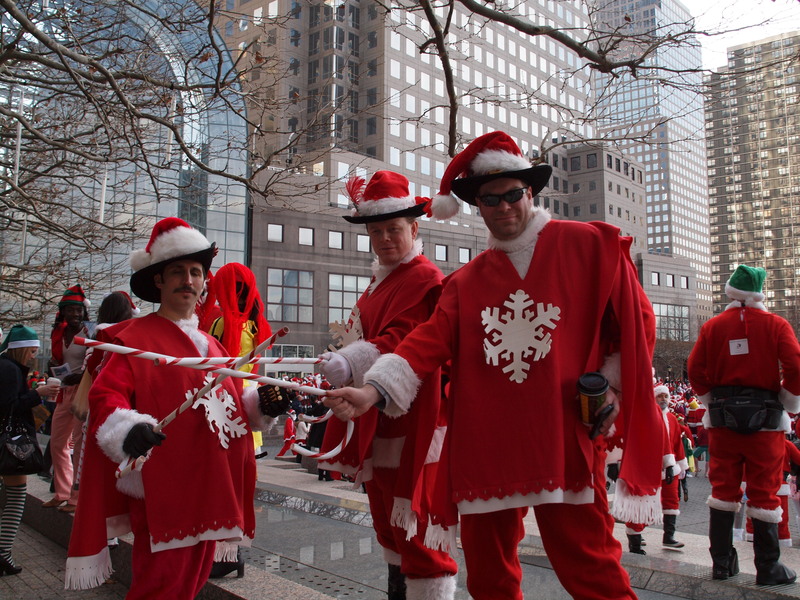 For the 2011 edition of Santacon, the day began at two different starting locations: one at a marina on the Hudson in lower Manhattan, and the other in Brooklyn Bridge Park. I chose the location in downtown Manhattan, since it would be somewhat easier to get to from my Upper East Side apartment. I joined a sizable contingent of Santas at Marina Cove, a pleasant waterfront area on the Hudson River, behind the World Financial Center. Eventually (after some time spent in various watering holes near the Marina Cove), it was time for all the Santas to move on. 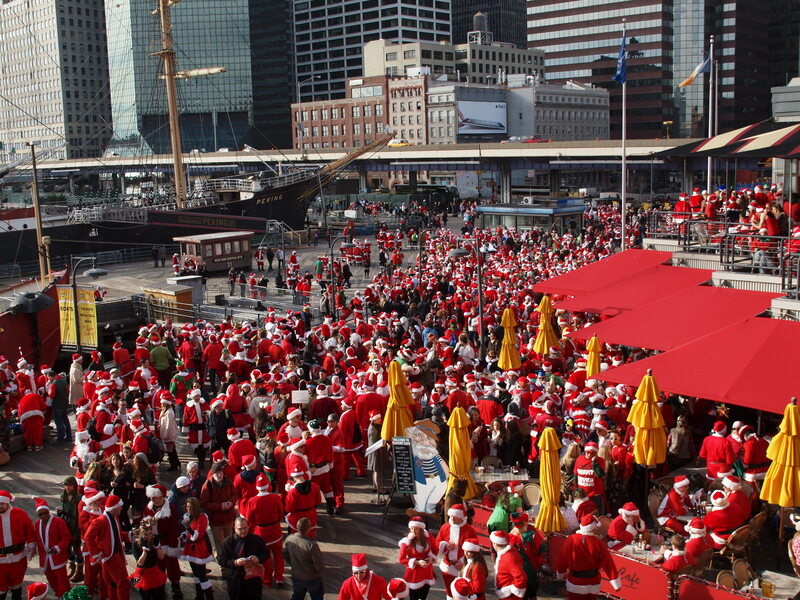 The word went out over Twitter that all the Santas were to converge on the South Street Seaport. So thousands of red-costumed revelers, together with their assorted sidekicks, made their way through the tangled warren of streets in lower Manhattan. Meanwhile, the Santacon cohort that had started in Brooklyn Bridge Park trekked across the Brooklyn Bridge to also end up at the South Street Seaport. I kind of regretted not beginning in Brooklyn myself (even though to do so would have required me to awaken at a ridiculously early hour), as it would have been nice to see all the Santas marching across the Brooklyn Bridge. Maybe next year . . . This musical ensemble was the Hungry March Band, based in Brooklyn. Following Grand Central, the next announced stop on the itinerary was the steps of the nearby New York Public Library. Those stairs are famously flanked by the twin marble lions, Patience and Fortitude. Sadly, by the time I had arrived in front of the library, the Santas were gone from the steps. In their place were some of New York’s finest, standing watch. It appeared that what had occurred in City Hall Park had happened again. There was only one thing to do: repair to a nearby bar for some much-needed libations. From that pitstop, it was on to the red TKTS steps at Times Square (the subject of the tweet quoted above). Here again, the Santas had already been banished from the steps by the time my friends and I showed up. This was becoming a recurring theme. So we boarded the subway and headed to the final official checkpoint of the day: Tompkins Square Park in the East Village. Despite the repeated appearances by the police, there were few incidents of the type that would put Santacon in a bad light; and none of the evacuations directed by the NYPD resulted in any confrontations or violence. For a humongous aggregation of drunken and exuberant Santas, Santacon tends to be remarkably devoid of misbehavior. Sure, there’s the occasional Bad Santa; but most people who participate are just trying to spread holiday cheer, and remain well-behaved. The worst offense that most Santaconners are likely to commit is a violation of the open container law (I may or may not have committed that offense myself). 🙂 I want to stress, though, that I understand where the police were coming from in their efforts to maintain order. I have a great deal of respect for the NYPD, which has done so much to keep this city safe — especially in light of the threats we’ve faced from would-be terrorists in recent years; and I’m sure the NYPD would rather not have to deal with the headache of the potential for undesirable outcomes that is inherent in a sizable flash-mob such as Santacon. And the important thing is that Santacon went on, and a good time was had by all. Naturally, given the subject matter of my blog, my day of Santacon would somehow have to culminate in karaoke. So, I eschewed the “official” Santacon afterparty, a ticketed event in Brooklyn that I strongly suspected would be too hipsterish a scene for me. Instead, after making an appearance in Tompkins Square Park, I remained in the East Village. I hit two bars in that area. The first was just some random pub, where I had a nice enough time and met some interesting people. The second was Sing Sing, a popular karaoke establishment on St. Marks Place (Sing Sing has an additional location nearby on Avenue A). So, during karaoke, some guy started singing the Blink-182 song, “All the Small Things.” Suddenly, an admittedly attractive young woman just grabbed the microphone from his hands, carried it to the other end of the bar, and started singing the song herself. She hijacked his song! Eventually the original singer reclaimed the mic and finished singing. He then approached the woman and asked her why she had committed her brazen act of microhpone-thievery. “I’m better than you,” she responded. She may have had a point (although, curiously, she didn’t submit any songs of her own to sing). H-Bomb standards: “New York State of Mind” by Billy Joel; “La Bamba” (the Los Lobos version from the soundtrack of the 1987 movie); and “True” by Spandau Ballet. No one dispossessed me of the mic while I was singing. Santas processing through lower Manhattan, near Bowling Green Park. Santacon's answer to the Three Musketeers. 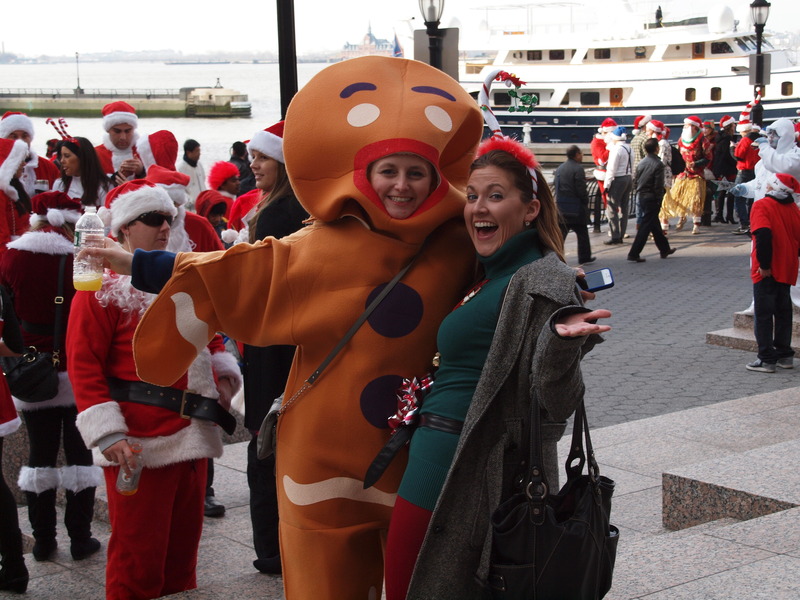 Gingerbread men (and women) are frequently seen at Santacon. 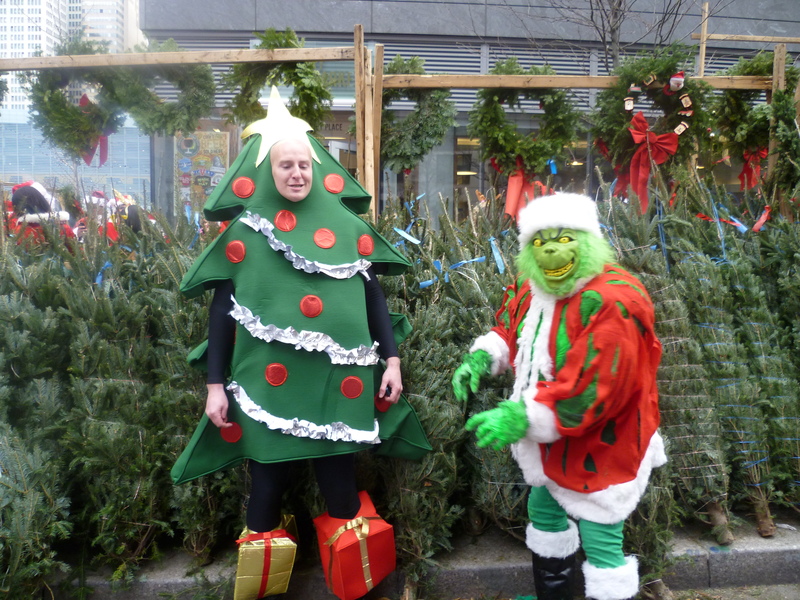 A Christmas tree finds comfort among his own kind, but is besieged by the evil Grinch. This woman dressed as a fireplace. She even used an iPad to provide continuous video of the Yule log! Some of the get-ups are quite irreverent. The birthday boy can always be counted on to make an appearance. Some of the Santaconners who ended up at karaoke. Is that a Viking Santa on the right? This is a riot – literally! Hahaha! Love the photos! I have never heard of Santacon. I hope one comes to Colorado. Maybe if I wear a beard they won’t notice I am a Ms. Santa! Awesome! I’m glad to see such a large group get together with no trouble for something pure fun! Santacon, setting an example for the world! Great post!! As soon as I read the title I knew this would be good. Wow. I actually saw a couple in Santa suits yesterday here in Paris. They did seem sort of odd. Maybe I missed the Santathon here 😦 I didn’t even know about it! Merci for sharing this! Pas de quoi! And you’re in luck — There’s a Santacon in Paris next Saturday! Great post with Great pictures . So many Santas together, i never ever heard or saw this. Thanks for making us all part of your celebration. Happy holidays to you and congrats for getting freshly pressed. You absolutely made my day (and probably my holiday)! I’m getting a circuit going for next year, starting with a Santacon somewhere and a Tuba Christmas. We have a “Santa Pub crawl” in Reno every year, and thousands of Santas pose under the iconic Reno arch for the group photo — but I’d have to say, New Yorkers do it better than we do! Yet another great reason (as if there weren’t sufficient reasons already), to LOVE my city! I’m an Astoria resident, Say Thank Ya’, and i live for these type of events. This, forget your pants day, flash mobs, and even just your run of the mill street/subway performers really coalesce to make this city what it is — one of a kind. Wow, wow, wow! This post was a perfect treat for me and I think I’ve had my today’s share of happiness and fun. Loved the photos and your descriptions, too! Fireplace is got to be my favourite. Sigh, if only I lived in this great city, wait – first the country! 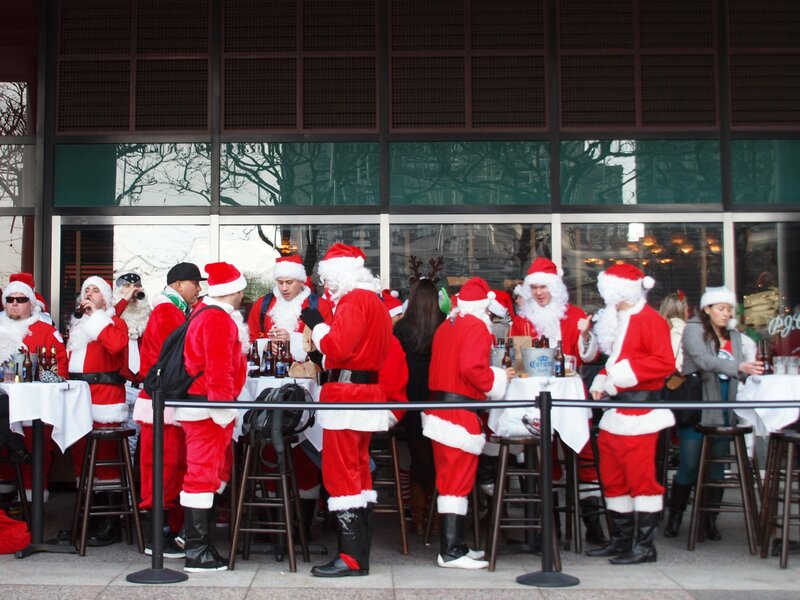 I have never heard of Santacon, but it looks like such a blast! Thanks for your account of it and the great photos! Awesome!!! Great idea and looks like a load of fun! Thanks for your post! I have to say, whatever bastardized version of Santacon YOU’RE talking about . . . it scares me! The one that I go to is family-friendly! Well, except for the part about thousands of people geting drunk in the middle of the afternoon . . . So many Santas! watch your cookies everybody! what a great idea i wish there was something like this in manchester. Love it! A plethora of Santas! If this were the ’70s, non-Santacons would probably just think they were having an acid flashback. Santa’s visiting a Bar!! I know what I need for Christmas … I just edited my wish list. I’ve never heard of a Santacon but it seems to set the holiday mood! This is amazing! I love the gingerbread costume it was so cute! Amaizing! never seen such number. Kids must be taken back by this parade of Clauses! Santacon in SF was also pretty amazing! My favorite costume was a guy decked out in Santa gear, shaking people’s hands like a politician, while his 5 elf-clad secret service guards surrounded him. They were equipped with ear pieces and candy-cane guns and everyone was in character! It was pretty fantastic! Jacqueline: That’s a cool costume. One of my favorite aspects of Santacon is the creativity that’s always on display . . . So THAT’s what that was! We happened to be in NY that afternoon and saw an occasional Santa strolling by; after the 6th one I thought they were congregating to get instructions on how to act as Santa at their jobs in Department Stores. But the sight of them all together must have been a blast! The Santacon sounds like an absolute hoot. I think there was one here in London over the weekend. The only reason I knew of it was because there were news reports that the Santas blocked the roads and Shaftsbury Avenue had to be closed! That is pretty funny, haha! hilarious! we have a santa pub crawl in des moines, iowa too. good times. thanks for sharing! This looks like such fun! I wonder if there’s a chance of a Santacon startup in an itty bitty town called Navarre, FL? Hmmm. Of course the meeting places would probably consist of Winn Dixie (southern grocery store which does sell wine and beer), Bubba’s house, and Navarre Beach. Now THAT could actually be interesting! Oh, that’s the cutest mini-santa ever!!!! 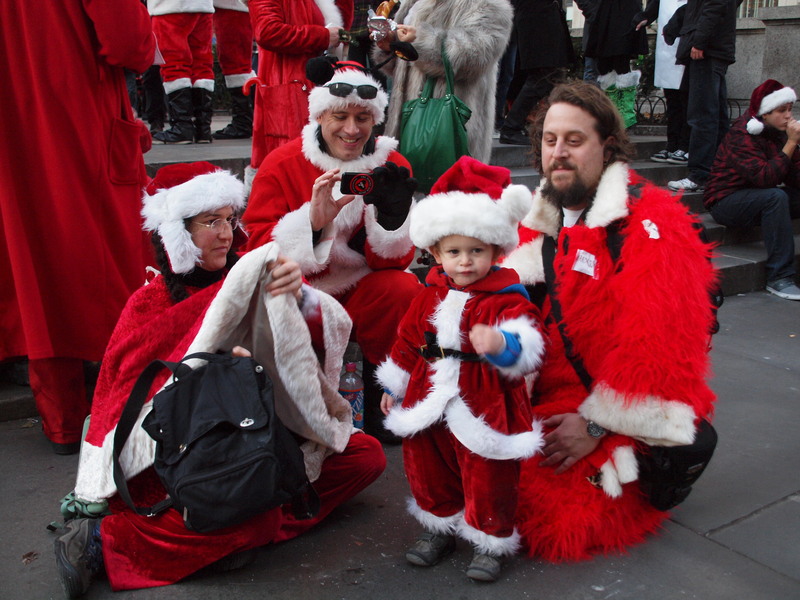 We celebrate Santarchy (or Santacon) in SF too… but I haven’t seen any baby-santas! Adorable! This is why I can’t get enough of New York, The entertainment everyday never fails. Ho Ho Ho..! 1coffeehouse.wordpress.com Got to love it. Santacon in Korea? That’s really awesome! And the NYC Santacon wasn’t nearly as huge in the early years as it is now, so maybe yours will eventually reach colossal proportions too! I think people everywhere in the world should be able to experience what we had in New York last Saturday . . .
Now THAT looks like a good time!!! 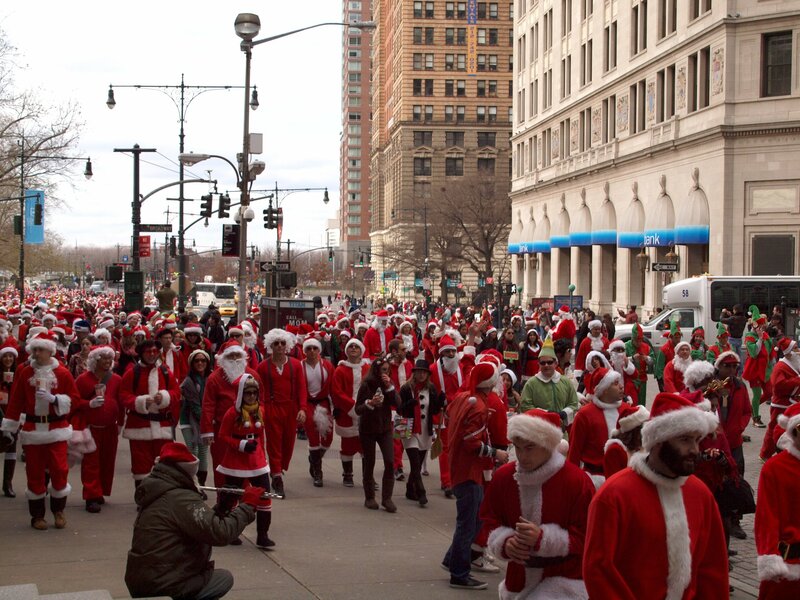 I think I know what I’m doing next holiday season–going to Santacon!It looks like such fun, if a bit crazy! Wow I had no idea that is an event in NYC! I gotta go one year. Thanks for sharing! This explains so much about my past few multiple-santa sightings! Even urinating and passed out santas. OMG. Do they do this on Easter? A million giant pink rabbits doing shots. That I’d have to fly in for! Cheers! And Happy Festivus to you too! There is no BunnyCon yet for Easter; but curiously, I did see one person dressed as an Easter Bunny at Santacon! Like I said, the costumes don’t always make sense . . .
Nice! Glad to see New Yorkers in the holiday spirit! “Santa Fe”=Hilarious. What a fun event! Congratulations on being freshly pressed. God! I miss New York. I used to live in Astoria, 35th St. & 28th Ave. Loved the place. Come to Vegas and do the same thing. Katie, you should have joined them! 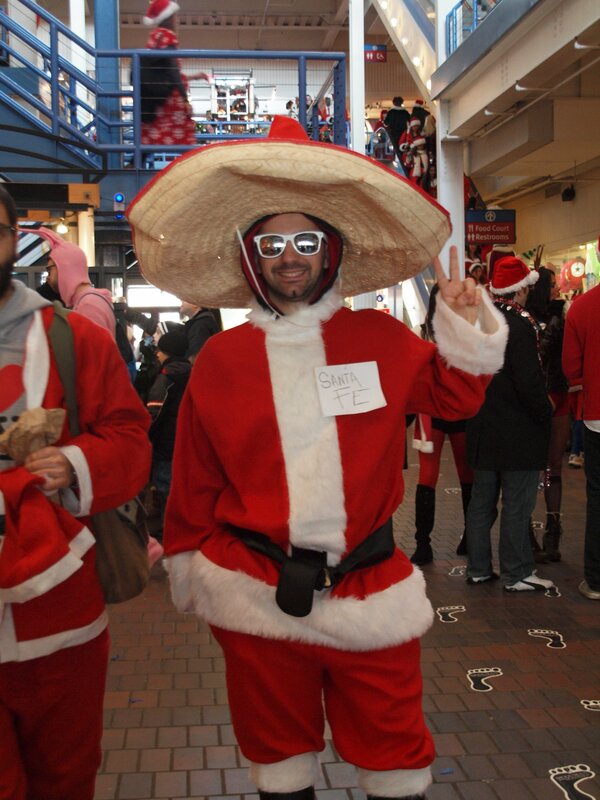 And I always like seeing (or at least hearing about) creative Santacon outfits! Oh how I’d love to see something like this happen while I’m present! Cred ca cei mai simpatici au fost Santa Muschetarii Clause. Dar sunt curioasa ce bea Santa: vin fiert cu scortisoara sau ciocolata calda, ori poate , ca in reclama, cafea? This looks like soo much fun!! I love the woman with the fireplace! Wow! There was even a Yeti! great event. nice photography. there was a similar event here in Edinburgh, UK last sunday. Also, check out my blog at http://imagineer100blog.wordpress.com/ if you’d like. This is the first time I’ve ever heard of any Santa event to such proportions. Where’s my Santacon? 🙂 Thanks for sharing! Every year I would see hundreds of Santas but didn’t know the reason why or the name of the event. Sorry I wasn’t able to itness it thi year. Was home sick. I want to be ready to take pictues next year too as I’m also a photographer. Great photos by the way! Absolutely hilarious! Nothing like this where I live in Aberdeen, Scotland! What a laugh… Thanks for sharing! Ahh! It’s a full-blown Santa infestation. Imagine if all this time, energy and costs of this event for each individual, who were involved, were put to good use, in assisting the poor in the slums of New York City. We truly have lost our way as a nation. Jesus… you’re ‘havin’ a laugh’ with those glasses! 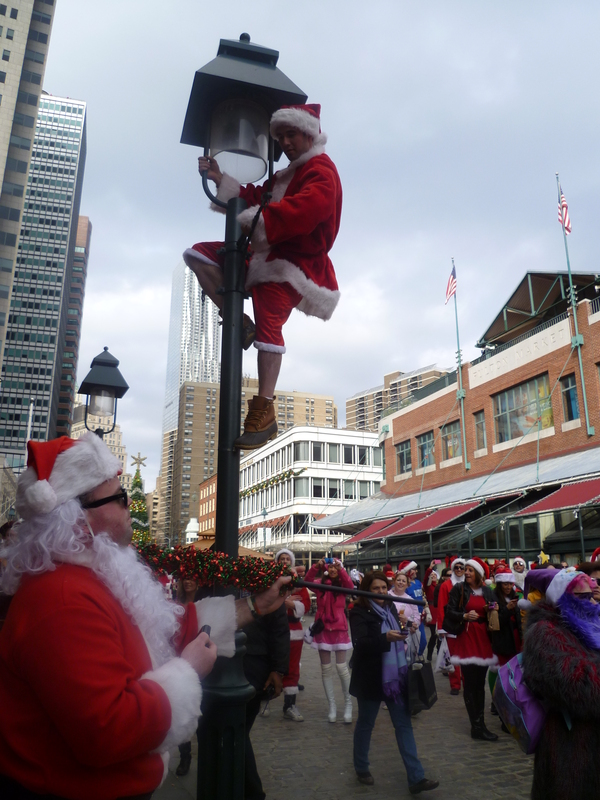 I think my favourite photo is the one of the Santa who has climbed the light post…probably because if I were there, I’d do the same thing…just ’cause. Aww, I wish I could have been there. 😀 haha. Were there many African-American santas? Nice post! Yes there were! Santacon does not discriminate! Wow, that looked like so much fun! I wonder how hard it would be to start a new chapter here. Thanks for sharing and congrats on being Freshly Pressed! Что Вы думаете о вашей фамилии? Вы сроду не размышляли, как тайна фамилии влияет на жизнь людей и влияет ли вообще? Ученые долгое время пытались выяснить, почему периодически судьбы современных людей копируют судьбы наших предков, в чем таится причина одинаковых судеб в истории и как связанна фамилия с будущей судьбой человека. Ради того, чтобы найти причину и разузнать ответы на все эти вопросы, ученые проводили исследование большого количества архивов, которые сохранились в наше время. OMG! That looks like so much fun. I feel sorry for the perplexed bystanders who instinctively knew there was a party going on without them. I guess the big difference between “laughing at” and “laughing with” has to do with your proximity to the joke. Love your sense of humor though, I will definitely add you to my follow list. happy Holidays! Great Pictures. I enjoy your blog very much..
awesome. i gotta check to see if we have santacon here. wouldn’t it have been cool if all the santas ended up at the karaoke bar? that would’ve been a site! 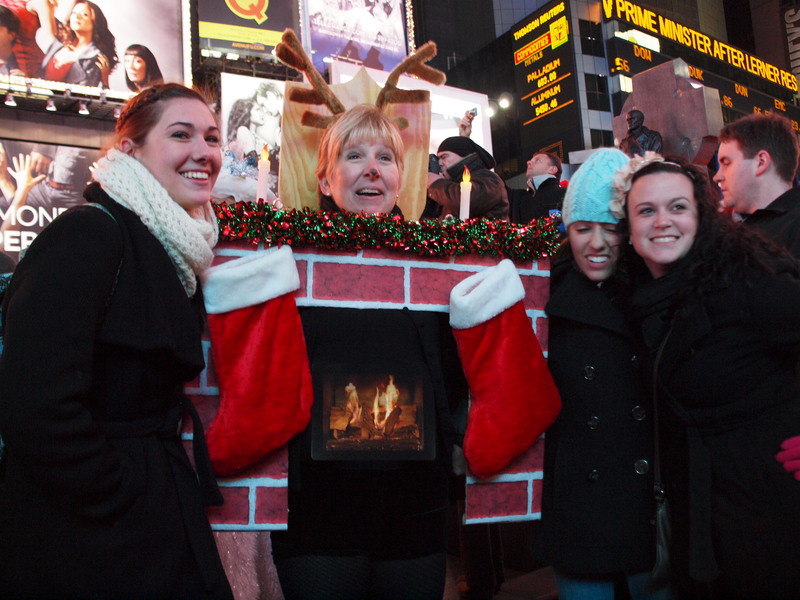 Love the creativity of the fireplace costume! I’m freakin stunned. I live in Staten Island, right across the water, and I never knew about this. Wow! It’s amazing and I love it. Whoohooo for Santacon. How pathetic is the practice of world Masonic witchcraft known as Santacon and or for Europe Father Christmas which is contrary to the 10 Commandments of The I Am that I Am. Unknown to many peoples the world over Santa and or Father Christmas represents the spirit of George Washington as the Masonic christ Tammuz the giver of life and gifts which has to be a great lie. Another unknown fact due to ignorance of a bombardment of misinformation of their new world order conspirators is that the graven image of George Washington is worshiped and honored as being known as the fatherhood of god and as the brotherhood of all mankind refer to The Apotheosis of George Washington. The word apotheosis literally means to raise a person to the rank of a god or as a icon a christ like figure. So in other words when mankind dress up as Santa’s and or as Father Christmas/X Mass they are merely portraying George Washington as their Masonic godhead or christ like figure. Simply meaning that GW is as the world’s sin of witchcraft titled as “Tammuz” which undoubtedly means by Jewish/Egyptian Freemasonry new world order terms that GW was and still is the son of life and or as the world’s X Mass Tree 0f life. The catch 22 is that this world renown X Mass Tree, decorated with the thousand points of light simply relates to George Washington as being the tree of light which relates to GW as the giver of life and light. Recall GW died on the 14th of December 1799 of loss of blood, a major red flag to the above. If you simply add GW birth date of the 11th of February 1732 to his death date of the 14th of December 1799 you receive the 25th of December X Mass Day! Which one is the real santa!?!?! I live in the Cincinnati area and was up in NYC Friday night and Saturday afternoon. My first sighting Saturday morning was of three santa’s on a subway. I thought nothing of it. Then more and more santa’s kept appearing on more and more subways. I finally had to ask one of them what was up, to which he replied “We’re just drinking man, and raising some money too”. 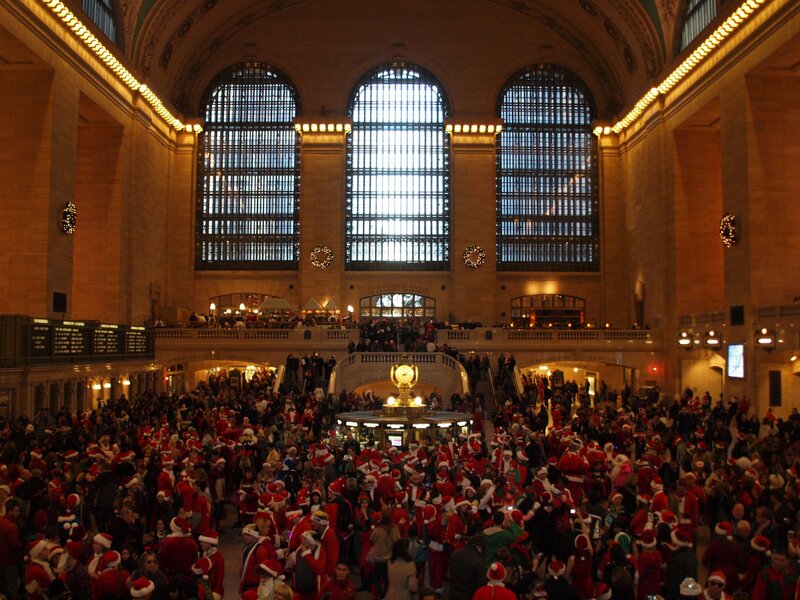 We actually got caught up in the masses of santa’s down by Battery Park and then at Grand Central station a few hours later. I enjoyed witnessed this very much and it definitely made this short trip to NYC a memorable one! The real Santa is the one drinking a Coke. Santa Fe! That’s genius!!! 🙂 I love this post and this concept. Americans can turn anything into a fun time. I don’t get it… The point is…? I don’t get it. The point of your comment is . . .? Why do people dress up in Santa costumes, hang around in large numbers, drink alcohol and then, like sheep, move to some other venus suggested by someone they don’t even know? What the point? I cant believe I didnt know about this! Every year I take part in the santa dash, dress up as santa and run 3 miles (about 5km)! But this is amazing! Funny I was gonna write about this as well, but I felt the subject would already get a lot of coverage, so who needs the opinion of a Messianic Jew right? Ahhh Santas take over the world!!!!!!!!!!!!!!!!!!!!!! Thanks to all for the generous comments and compliments. Well, maybe my thanks don’t extend to that one guy who said that no one should be allowed to have fun at events like Santacon because they should all be helping poor people 24/7. Or the person who burst my bubble by pointing out that Santacon is really just a manifestation of Masonic witchcraft. 🙂 But to the rest of you: thank you for visiting my blog. Your feedback is much appreciated, and I hope to see you here again sometime! There’s one in Seoul, South Korea that usually attracts a good many people too. Damn … I LOVE New York. Almost thirty five years ago, when I stepped off the plane and onto the bus into Manhattan I was in love. First snack at Horne and Hardart …. then lumbered up to International House, Where life began. There’s something unique about New Yorkers … a spirit I’ve found nowhere else. Didn’t have Santacon when I was there. But I’m not surprised to see this celebration of fun and spirits …. of both kinds. To hell with terrorists and fears and threats, damn it …..we’re going to live life and enjoy and celebrate. Way to go !! Why can’t every day be like this? Great share! Dude, what the…??? That one link (http://howto.wired.com/wiki/Walk_Through_Crowds) mentions both Grand Central and Aberdeen Proving Ground in the intro. Weeeeeird. I’m not seeing the Hungry March Band video, huh. Just FYI. I’ve been to Sing Sing Karaoke numerous times, it’s across from the Sidewalk Cafe! 😀 Wow, good memories. I ought to sing one day. Have I ever done a karaoke song in your presence? I don’t think I have, though TaxiCabJoe wanted me to that one day. Too bad I wasn’t in a better mood. Guess I could have done a Black Sabbath song or something. Love the photos! Dude, seriously, I miss your photos. Sorry, I hate Facebook with the unbridled passion of a thousand white hot suns. That first photo, is that dude there on the left playing a flute? Nice shot with the Winter Garden behind the Three Musketeers. “A Christmas tree finds comfort among his own kind” <– hahahahaha dude, laughed out loud, LOL'd for real. That was good. The Yule Log fireplace rocks! @Becca D: Your unfortunate inability to see the video is probably due to some issue with your browser or settings or something, since I know that others have been able to watch it. Yeah, in the first photo there was a man playing a flute and soliciting donations. He was there before the Santas began marching past. I think next year they’ll do another one like this but double the numbers. Plus some snow. Still crazy and cool 🙂 Cheers! Wow, I was already impressed while running 3 miles with 5.000 Santa’s during the Santa Run in Antwerp, Belgium… this is just crazy :-)! Check out http://52weeks25.wordpress.com for the blogpost and follow me on my journey, 52 weeks as a 25-er! Crazy Santas. Must be a visual treat for those who witnessed it.